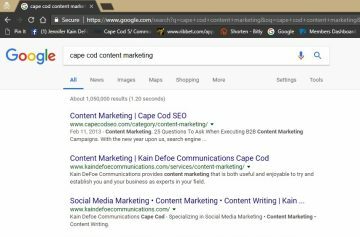 When I launched Kain DeFoe Communications, my Cape Cod content marketing firm, in 2013, I built my website using GoDaddy’s online design tools. For the first three years I was in business, it served my new company’s needs; it was attractive and it offered info on the services I provided. What that self-built website did not do was get Kain DeFoe Communications new business from people who were not familiar with me or my business. After living on Cape Cod for 30 years, and working as a writer for 10+ years, I was fortunate to have a lot of professional connections and a fairly well-known name. 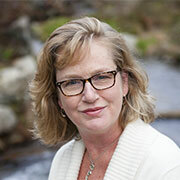 It was for these specific reasons that I chose to incorporate my name in the business’s name. As the company grew, it outgrew that self-built website which is true of many businesses. Because I was smart enough to surround myself with smart people, I realized that if I wanted business owners who had never heard of me or my company to find KDC online, I needed a professionally-built website. KDC offers starter website design, which we clearly state. But we are not able to do the behind-the-scenes SEO magic that an actual website developer can do. We may rock social media marketing, and we’re aces at writing keyword-rich web content, but color us clueless at writing code. Within less (way less) than a year of KDC’s new site going live, we now rank at number two and three in an organic search on Google for the key phrases that describe our services. I told the developer which segments of the business I wanted to grow, and in what region I felt the growth was most important. And they worked their magic. So, how’s your website doing?